for April 5th are Joyful. Please tune in & pray with us! a word of comfort to the weary. Jesus: My dear child, with angry hearts and hatred on their faces, they poked at Me and condemned Me to death. I stood so silent, My hands tied, in perfect peace, because I knew the Father's love. I knew the Father's Will. You too will stand your trials in perfect peace, the more you realize the immense love the Father, Son and Holy Spirit have for you. Pray to the Spirit to transform you more and more into My image and, through this transformation, you will be led ever closer to the Father. Oh, how I love you! Jesus: They gave Me a heavy cross, laden with the sins of the world. They placed it on My shoulder. It was so heavy I felt as if My shoulder would break. I ask you to carry little crosses, to experience little pains. I could not remove this cross from My shoulder. The weight was unbearable. It is through My suffering and death that you receive new life. It is through your sufferings this day that you will grow in your life with Me. Oh, child, I loved you so much that I took up the cross of salvation. I love you. Please realize that I am talking to you here. To My death I loved you. Oh, how I love you! Jesus: The cross was so heavy I could hardly walk. I held on to My cross for greatest love of you and in compliance with the Will of My Father. It became so hard to walk! The cross was so heavy! I fell. I fell and the cross fell on Me. They poked at Me, they struck Me, they demanded I get up. The pain from the instruments they used to poke Me and strike Me was so great! I somehow managed to get up. When you fall under the weight of your cross, come to My Eucharistic Heart. I am no less present in the tabernacle and in the Eucharist than on the day I carried My cross. I wait with the same love that I had for you when I carried this cross and suffered such agony. Oh, how I love you! Jesus: I saw the face of My beautiful Mother. She was weak, her face reddened and full of tears. I saw her tender heart, her love, her anguish, her pain. I saw My dear Mother Mary. My Heart was comforted by the sight of her, but torn by her suffering. Mary: As I looked into the eyes of my beloved Son, I saw His love. His head, bleeding and wounded. His body weak. His clothes covered with blood. I looked into His eyes and I saw His love for you. I call out to you today. I appear today with a face full of anguish and tears. I appear to call you back to the love of my Son. See through my eyes, as I peer into His eyes, the love He has for you this day to give of Himself for you. Oh, He loves you so much, my little children. See through my eyes the love of my Son. Oh, how He loves you! Jesus: The cross was so heavy I could not move. My persecutors became angry and forced a man to help Me. The cross was so heavy the two of us could barely move it. How is your cross today? Does it seem so heavy you cannot go on? I am forever watching you. When you are suffering the greatest, I am very close to you. It is in immense suffering that you realize My great love for you. Pray for grace to do always the Father's Will. Pray for grace to grow in your knowledge and love of Me. Jesus: My face was covered with blood. From the crowd Veronica came forward with a cloth to wipe My face. On the cloth I gave to you an imprint of My bloodied face. This, My children, remains with you this day as a sign of My immense love for you. But more than any cloth, look beyond the visible consecrated host. I, Jesus Christ, the Son of God, remain with you, Body, Blood, Soul and Divinity, in the Eucharist this day, waiting and longing to be with you. Oh, how I love you! Jesus: Oh, dear ones, the road became harder and harder to walk. The cross was becoming heavier, My body weaker and weaker. My shoulders and arms hurt so much! My head throbbed as I walked. The blood came from My body, from My head to My feet. I was covered with open wounds. I could not go any farther. I stumbled and fell. Again they poked at Me, only harder, and with such hatred they kicked Me. Such vileness in the hearts of men! My greatest agony was not the agonies of My body, but the agonies of My heart for the love I have for all My precious souls. I loved them so dearly. I loved those who persecuted Me. Oh, how I love you! Jesus: The women came to Me with their children, their tender hearts crying and wanting to comfort Me. I saw their love, their care. I saw the coldness of men's hearts for all time, the hatred, the anger, the sins, all the souls that, despite all of My sufferings and death, would be condemned to eternal damnation. I told the women to weep not for Me, but for themselves and their children. My greatest agonies were the agonies of My Most Sacred Heart. Oh, how I love you! Jesus: I fell hard the third time. I was so weakened I could not go on. My body collapsed under the cross from such exhaustion! My child, My child, My greatest agonies were not the wounds to the body. They were the wounds I experienced to My heart. Do you know a little more now how I love you? It is in meditating on My Passion and death that you will realize My immense love for you. When you fall, when you struggle, I give you the grace to get up. I never give you more than you can handle. Your strength will come from Me. Come to My Eucharistic Heart. I am waiting for you this day. Oh, how I love you! Jesus: They took Me to the hill to crucify Me. They angrily stripped Me of My garments. They took off My clothes to whip Me. They had covered My bloody wounds with a dirty purple robe. Now, total surrender-they took off My clothes. I showed you the way to surrender, always complying with the Will of the Father. It is in living in His Will that you will have peace and joy, and life eternal some day. Oh, how I love you! Messenger: See Mary as she holds the little Baby Jesus. See her as she washes His tender hands and feet. See her now as she watches as they pound into those same hands and feet the gigantic nails that fix Jesus to the cross. Mary: Oh, my dear ones, my heart was torn in my chest as they nailed His hands and feet to the cross. I ask you this day to walk the Passion with me and see through my eyes the love He has for you. He truly was nailed to the cross. Jesus: They pounded the nails into My first hand, then they stretched My body and nailed My other hand. The blood poured from these wounds that went totally through My hands. My pain was so immense, but then they nailed My feet! You do not know what pain I suffered, My child. My children, My children, for each one of you I suffered this pain. Oh, how I loved you! Messenger: He hung for three agonizing hours on the cross against the darkened sky. His greatest agonies were not the agonies of His body, but those of His Heart for the great love He has for each and every soul. Jesus: I gave Myself to you, My dear ones. I gave My all. I hung with My arms spread in total surrender. My head was punctured; My hands and feet were nailed to the cross. I gave Myself to you. I give Myself to you this day in the Eucharist. I give Myself to you. I, God, give you Myself! What more do you want? Song: Oh, burning Heart, oh, Love divine, etc. Messenger: They pierced His Heart with a lance and what flowed forth was blood and water, the sacramental life of the Church, water for Baptism and blood for the Eucharist. His life, death and resurrection live on in the Church this day. Messenger: His totally lifeless body was placed in the arms of His most loving Mother. As she had held the little baby body in her arms, she now received His bloodied, bruised body in her arms. This is how He obeyed the Father's Will. Jesus gave His life for us. The Father gave His only Son because He loves us so much. Mary, His Mother, our Mother and the Mother of the Church, is forever by His side. See Jesus in the arms of His loving Mother under the cross. This is love. Mary: I held His lifeless body in my arms. See through my eyes the love He has for you this day. 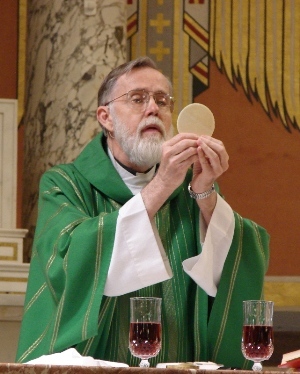 He gives Himself to you today in the Eucharist. He loves you so much! Messenger: His enemies rolled the stone up to the tomb and were pleased to have buried Jesus. Mary, outside the tomb, wept bitterly. The cold reality that He was dead! But death has no power over Jesus for on the third day He rose, triumphant, from the tomb! We are partakers in His divine life. Death has no power over Jesus. He is with us this day. He comes to bring us life to the full. He loves us so much! 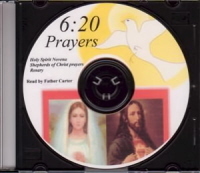 This rosary was said by candlelight during the Tuesday Shepherds of Christ meeting. Jesus told Rita to pray this rosary in front of the Pieta statue in the back of the Rosary chapel. Rita was in an ecstatic state. Some present at the Rosary saw Jesus alive in the statue and blood running from His wounds. During the crucifixion His face was white. Mary was seen crying. R. Be there with Jesus in the Garden in the darkened night as He kneels. Before Him He sees all the sufferings He is about to undergo. R. His Heart is in such anguish to see before Him all the souls that will be lost despite all the sufferings He is about to experience. R. We tap ever so lightly at the door of His Heart. He is an endless, burning furnace of fire, on love for each one of us. He says, "You do not know even the smallest amount of the immensity of the love that I have for you. You must come into My Heart. It is in My Heart that I lavishly give you My great love." R. Think of the Heart of the Virgin Mary from the first moment of conception and how she carried the child within her womb, how she watched Him at play. All through His life Mary was there, to His death on the cross. How her Heart knows the Heart of Jesus! She stood under the cross. She held His lifeless body in her arms under the cross. It is through the Heart of Mary that we will more tenderly embrace the love that Jesus has for us. See Him as He kneels in the Garden, His Heart in such anguish. His sweat became as great drops of blood upon the ground. He knew all the souls that would reject this immense love that He has, who would not even care, who would go about their days without even thinking of Him. Yet He longs to be so united to each one of us so that every action we perform is an acton we do in oneness with Him. Jesus' Heart was in such anguish that His sweat became as great drops of blood on the ground. R. Think of the mystery all through this rosary! Think of the mystery! There is a mystery when there is blood! The blood comes from deep within. Think of the mystery that Jesus sweat blood! He was in such anguish! R. He tenderly calls to us day after day. Do we hear His gentle call, deep within our hearts, to be joined ever closer to Him? How many times do we reject the love that Jesus outpours to us because we are not sensitive to the little call that He makes to us in our hearts. He suffered in the Garden for all the souls He loved so dearly, some of whom would reject Him totally. R. He suffered in the Garden for all of our sins, for our haughtiness and our pride, for our lack of compassion and mercy for our brothers. Yet He gives to us unconditional love and asks us to love one another. In the Our Father we say, "Forgive us our trespasses as we forgive those…" He suffered for all the times that we say no to forgiving our brothers. We forgive some but not all and think it is okay. Jesus loves each and every soul. Jesus: Come to My open Heart through My pierced side. Look at the wound in My side. Suffering helps you reach My immense love. Enter My Heart through My pierced side and fall deeply into the abyss of My great love. Jesus: Do not let your hearts turn cold! You must come to Me with hearts that are soft and ready to love. Put aside all the hardness in your hearts, for a soul that is haughty and angry cannot unite with My love. I long to be in the deepest union with each one of you present. So deep! You cannot fathom the great love that I have for you. You must clean your hearts of all the debris. Sweep away the unforgiveness and come into My Heart through My pierced side. Jesus: My Heart was in such agony that I sweat blood. Do you know, even a small amount, the immense love that I have for you? I was born a helpless baby in the town of Bethlehem and I gave My flesh and My blood for love of you. R. Think of Jesus! Visualize Him, totally present, His body here! See Him as they lead Him away. They poke at Him! They pull His hair! See this so clearly in your mind. A person named Jesus being led away! R. What a sight for our eyes if we truly saw what happened there, if we saw them with such violence and anger tie Jesus, our friend, to the pillar and then take out weapons and beat His flesh! R. This is your best friend, Jesus Christ. They have tied Him to a pillar and they are beating Him with instruments that are tearing His flesh. The blood is pouring down His body! R. They shout at Him and they holler angry and ugly remarks. He does not respond, only grunts as they hit Him harder. To their own exhaustion they beat Jesus. Watch this! Jesus: It is in your heart that you will know Me, My dear children. You must visualize more and more the lives of Myself and My Mother. As you go through these mysteries of the rosary, put yourself there. See as if you were present. Experience what I went through. It is in knowing Our lives that you will know the great love that We have for you. R. He stood in a puddle of His own blood! R. This is my beaten friend Jesus! He shed His blood for love of me so that I may be with Him forever in heaven. R. Hear the blows that they give to Jesus! Listen! Hear the blows! These are the blows that He suffered for love of each one of us. He suffered those blows for each and every soul, the poor beggar, the person that is a little different, the person that is not as rich as I am, the person that is somewhat short, the person that I think looks strange. Jesus stood at the pillar and was beaten for each one of these persons. These are my brothers! When Jesus came to the world, He made us brothers with God! R. If I stood at the pillar next to you, Jesus, and they beat my back and tore my flesh, if I did it for someone here and they did not even think about me, how my heart would ache. But you are God! You, who are infinite Love, suffered this brutal persecution for love of each one of us. How did Your Heart ache, Jesus, when you suffered your bloodied flesh and knew that people would not even think about You? R. And what do you ask of me, Jesus? To love God and love my brother! To become more closely united to You as You outpour divine love and divine life! Jesus: I call you to purity. I call you to open up your hearts, to rid yourselves of anything that is impure. I long to be closely united with each of you. People are watching you! If you call yourselves Christians, then you must act as I would act! Do you preach the Gospel in your actions? Is your way the way of love? I came to show you the way. Will you follow Me? Will you love all your brothers as I ask you to do? People are watching you, My faithful Christians, apostles that I send into this world to spread the love of My Most Sacred Heart. You are being watched and are teaching so many lessons through your example. I call out to you today to rid yourselves of all impurities in your heart. Then you will receive a reward that far surpasses anything you can gain on this earth. You will receive closer union with My Most Sacred Heart. I love you! I love you! I love you! Moment by moment, second by second, I am there to provide you with everything you need. You must surrender and trust in Me! Jesus: They tore My flesh! They beat My body! I shed My blood! They pounded into My head a sharp crown of thorns that pierced My head and punctured My forehead! R. Jesus, You bled for love of each one of us. Help us to realize during this Lenten season the immensity of Your love as we meditate on Your wounds, the wounds to Your most precious Head, the wounds that you suffered to Your hands and feet. How would it be to rub our hands across Jesus' head, to touch the puncture wounds from the thorns! He truly suffered this for love of us! R. The thorns were pounded into His head and He bled down His face and into His hair. Think of His hair covered with blood from the thorns that punctured His head! R. Let me kiss your wounds, dear Jesus, the wounds that you suffered for love of me! Let me enter into the wound in Your side. The more deeply I enter into this wound, the more I enter the abyss of the endless love of Your Most Sacred Heart. Song: Crown Him with many crowns, the Lamb upon His throne. His regal scepter knows no bounds, all kingdoms are His own. All Christians come and sing to Him Who died for thee. And hail Him as our Savior King for all eternity. R. Jesus is God! He is the King of all Kings! God took on a human nature and came into this world a helpless baby. Now He is spit upon and taunted, He is hollered at and He sits on a mockery of a throne. R. We look for love in so many places when, minute by minute, second by second, Jesus is inside of our hearts telling us how He is truly there and loving us. R. If you put your fingers into the nail marks in His hands and into His side, would you believe that, minute by minute, second by second, He loves you so much, and that He is God and will provide you with all your needs? Song: Only this I want, but to know the Lord. And to bear His cross and to wear the crown He wore. R. Minute by minute, second by second, hear the soft, gentle voice within your heart say, "I love you, I love you, I love you. It is in realizing this immense love that there is love to give to others. R. He came to serve. He came into the world in such poverty in a stable in the town of Bethlehem. He left this world hanging on a cross. Both were bare wood! He came to show us the way! Meditate on this mystery as He carries His cross. The Son of God! He took on human form for love of us. He came to show us how to love. R. Jesus came and He loved and He preached the Gospel. His way was love. He always acted in love and they condemned Him to death. When we preach the Gospel, when we act from love, why do we expect people to treat us differently when they treated Jesus this way? But He came and carried His cross to show us His way and His way is the way of love. He promises to us an everlasting reward far beyond our comprehension. Look at the Virgin Mary and the Pieta. Look at her face and see through her eyes as she watches her Son, with the cross on His back, covered with blood and wounds. This is her beloved Son! Look at her face. She comes today to ask us to go into this world and to spread His love. She asks us to open up our hearts and put aside any hatred or anger that we have, for if we do not spread this love, who will spread love into this world? Open up your hearts! Be not hardened but be as Jesus has asked us to be, with hearts that are filled with love, going into battle in a world that has forgotten God. He calls us this day to be His soldiers, to spread the fire of His love throughout the world. You may be persecuted, you may be spit on. Whatever happens, remember what they did to Him. His way is love and His reward is everlasting life. R. These are rosaries from the Hearts of Jesus and Mary. See their eyes as they gaze at one another on the way to Calvary. Look at her face here! The horror, on top of more horror, to behold her beloved Son in such anguish! She asks us to see through her eyes the suffering that her Son endured for love of us. The more we realize the love He has, the more we will go into the world and take this love to others. We are soldiers of the Most Sacred Heart of Jesus. R. He wants to become one with us so that it is no longer we who operate, but it is He Who operates in us, so that our every action is an action that we perform with Jesus, and the might is the might of the Almighty God within us! In order to unite this way with Him, we must be ever pure. Love unites only with love! If our hearts are filled with hatred and anger for any person, we cannot be one with Him. He longs for this love. He longs to be one in us! He wants to penetrate our souls with the fire of His love. Pray to the Spirit so that the Spirit moves inside of you. R. See the horror in Mary's face and in her eyes. How would your face look if you were looking at your Son, covered with blood and wounded, as He fell under the cross? How would your face look? How would your heart be? It is through Mary's pure and sinless Heart that she will take us deeper and deeper into the Heart of Jesus. There is such oneness between these two Hearts, such connection between them! Look at the Pieta and see her, see her face, as she watches the Passion of her Son! R. They hit Him on the head and the blood ran from the corners of His mouth. His face was covered with blood and Veronica wiped His face. Jesus: My children, My children! I do not tell you things to be taken lightly. In My Heart I am longing for such union with you but you do not hear. You close your eyes and plug up your ears. You do not listen time and time again. I have come to you this evening and I have asked you to pray in front of this statue. I ask you to meditate on this. You do not know what I am saying to you. You take these words lightly. This world is in pain. You do not know the sufferings that are about to befall you. I ask you to listen, to listen to Me! I am truly Jesus Christ and I come to you this day and I beg you to spend your waking hours spreading My love throughout this world! I beg you to help save souls from damnation. Your actions are so important to Me and the plan of the Father. You are here because you are called and you have answered this call. Each and every one of you present I send into this world as warriors to spread My love. You listen and you take it so lightly but you will know that I am truly calling you for this world is in such sin and pain. To the little work that you do I will apply My grace to lead souls to My Most Sacred Heart. Surrender and become one in Me for I truly am calling you to the highest union for it is in this union that I can operate through you. As long as you resist My call there are many souls that will not be touched. I beg you to take Me seriously. Meditate on this statue (the Pieta). Meditate on this, My children. Jesus: I carried My cross on My back And I fell under the cross. See Me as I crawl with the cross on My back. Jesus: This is the love that I have for each and every soul. The bodily agonies I experienced were nothing compared to the agonies I experienced in My Heart for the souls that would be condemned to eternal damnation despite My sufferings. I beg you this day to answer My call. R. He hung for three agonizing hours against the darkened sky. He gave His flesh! He gave His blood! He gave the last beat of His Heart, the last breath in His body! Covered with blood and weakened, He hung on the cross! Jesus: I speak and so many do not listen! I am crying out to you to listen to My voice here, to read My letters for they are truly letters of love that I give to each one of you. It is in reading these letters that you will know more and more the immensity of the love that I have for you. You are My soldiers that I send into the sick world with the medicine to heal so many hearts. You are the chosen ones I have called here to this Center. Please, I beg you, take My call seriously, for I am truly Jesus and I speak to you this day. So many take My plea lightly. I beg! I plead! I ask Rita to talk more and more about My pleadings. You do not know how I am longing for you to be so close. How I want you to surrender and let Me operate in your hearts! You tap ever so lightly when there is an ocean of My love that I want to give to you. Surrender your hearts and read My letters of love for it is in these letters that you will know My love more and more. Jesus: I give Myself to you at every Eucharist and you take it so lightly! Take Me seriously, My children, for I am truly with you with much love! How it wounds My aching Heart that you do not listen. Jesus: I am sending you into battle in a world that is godless, that has forgotten God, but with your hearts filled with My love. Will you answer My call? Jesus: Surrender! Surrender! Surrender to the God Who gave His life for you! Jesus: As Mary walked by My side on the way to Calvary, as she stood under the cross, she is by your side in all your sufferings. You are never alone. Jesus: I give you My very own Mother! R. As she held His little baby body, she now holds His lifeless body in her arms under the cross. Song: At the cross her station keeping stood the mournful Mother weeping. Close to Jesus to the last. R. This rosary is from the Hearts of Jesus and Mary, so united, one with each other. To love Jesus is to love Mary. To love Mary is to love Jesus. the evils of this world. families they will know relief. they will experience a new freedom. the fires of love in My Heart. A bed of roses I will bring them. A light to shine in their darkness. Image site — great grace for healing. me as the Lady of Clearwater. intimately close to My Heart. I will refresh them with My love. who open themselves up to Me. Jesus speaks: I am Jesus. I have spoken as never before, you will spread My love to all souls on this earth. 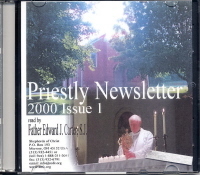 Messenger: When I received this message and saw the vision on March 26, the bells tolled at 8:00 a.m. and at 9:00 a.m. The vision of Jesus' Heart on fire I had in the same pew at All Saints Church, December 17, 1991. The heart that is on the 2nd Blue Book. The first vision March 26, 1996, I had in the same pew on the other end of the pew toward the center aisle, the first pew on the right side of the church as I faced the altar. Messenger: I was alone in All Saints Church after Mass and Communion, in front of the tabernacle, when I saw the Sacred Heart. It was red around the outside, then a layer of yellow and then the brightest light in the center. I felt heat and it looked like an open furnace. "Open your heart to the fire of God's love. He is ablaze in your heart. He wants to dwell in you and love you and others through you. Love God, yourself and one another and experience the fire set aglow in your heart and experience the warmth of His love." as we prayed before the image. then any words I can account here. Jesus speaks: How, child, do I, Jesus, tell you I love you? You hold on to silly things when God is in your midst and is ardently loving you. I am Jesus Christ, the Son of God. I am writing to each precious child this day. I am on fire for love of you. I remain in the Eucharist to be with you with My ardent love. I did not want to leave My beloved ones at the Last Supper. I love you so, My dear and ardently loved children. I remain with you this day in the Blessed Sacrament, the same Jesus Who died a brutal death on the Cross.